What’s the real story behind the title of your book From Para to Dakar? 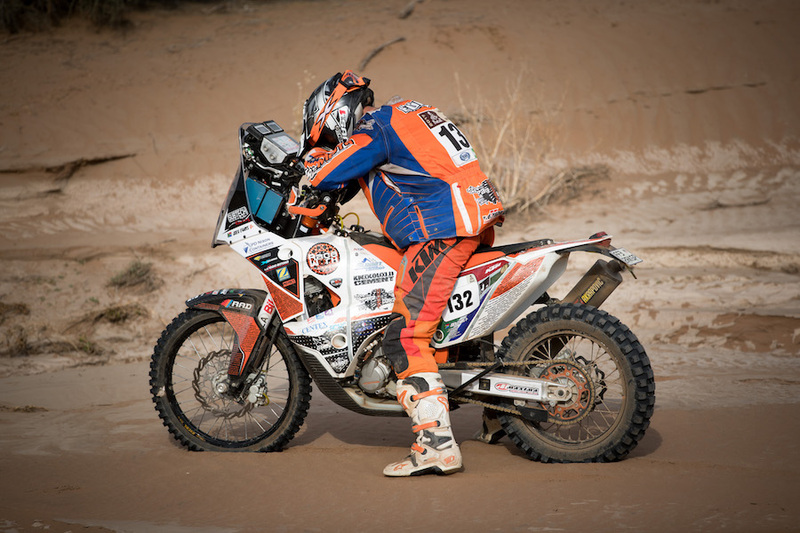 The Paris-Dakar was the original name of the Dakar Rally, and my journey was from being paralysed to finishing the Dakar. 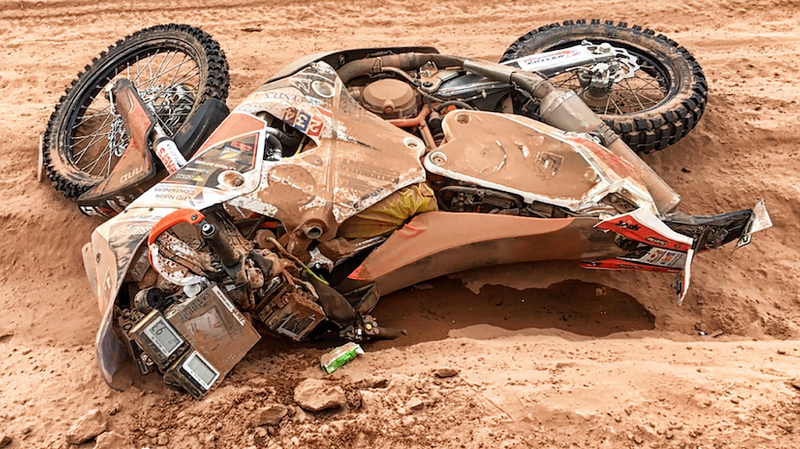 It took me 10 years to get to the Dakar finish line after breaking my back in 2007. 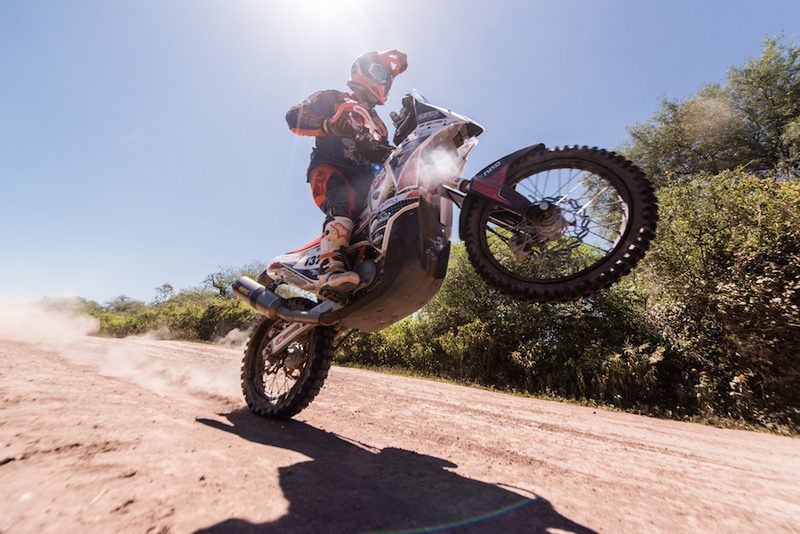 Despite your bike being run over by a rally car, you were the only South African out of three to finish the 2017 Dakar. It was super-cool to get there. For three of us to start and being the only one to finish was amazing. Throw in my bike getting run over by the car and then finding another bike (for donor parts) in the desert… you can’t make this stuff up. You are in Australia doing motivational talks, including one for KTM. How did that come about? 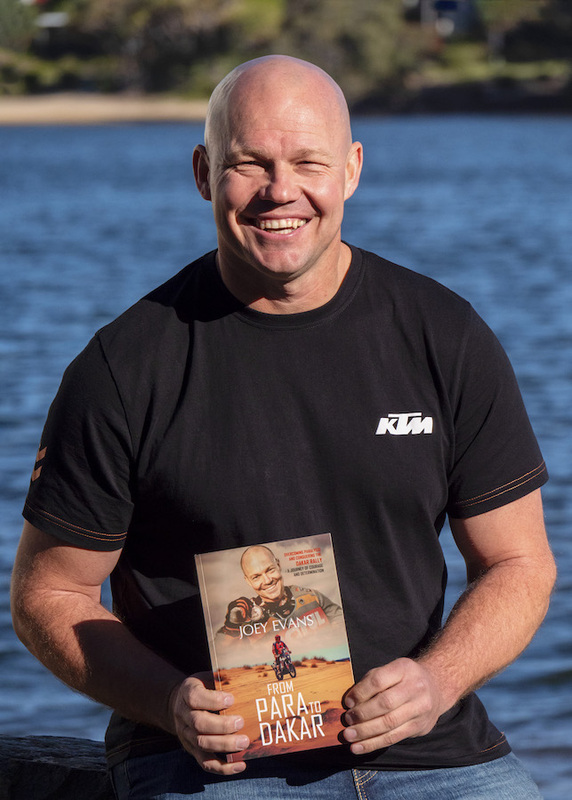 When I first got back from the Dakar, there was a lot of TV and magazine stuff, and then writing the book. The book was really the big thing; it started in April 2017. Writing… you just live and breathe the book. Then the talks started taking off. You think, ‘Just get up and tell your story,’ but that doesn’t hack it, you need a story people can understand. I’ve done about 70 talks so far. It’s a whole new adventure. While in Sydney I swapped a ride on a bike for a talk at KTM. When you look back to when you were in a wheelchair to where you are now, could you imagine you would be a motivational speaker? No, never ever in a million years. And writing a book… I don’t even read books (laughs), but that also is of value because when I write, I write like I talk. I just tell the story and the lessons are there, and the guys can see it and it comes across genuine and real, and a little bit raw, and that’s relatable. People tell you that when things are really wrong maybe there’s a reason, and you want to say, ‘What do you know? I just got injured because it’s going to be good for me?’ Breaking my back was a terrible, terrible thing, but it’s put me on this path that is just incredible. It was exactly the same as when the car went over my bike; at the time I was seething, I was so mad, but I look back now and that was awesome. What an incredible story. That rally car going over my bike and just destroying it and almost putting me out of Dakar was one of the best things to happen to me! You are classed as an ‘incomplete paraplegic’ and you’re on a mission to help other injured people. Where I do the most is with guys who have had big injuries. In the beginning I used to get these kinds of calls and I would think, ‘I don’t know how to help this guy,’ and then I realised that I don’t have to take his physical challenges away; he knows I can’t do that. But if you go around and visit and hang out for an hour it will make a big difference in his morning and that makes a difference in his mindset, and sometimes that will make a big difference in his life. There’s a lot I want to do. 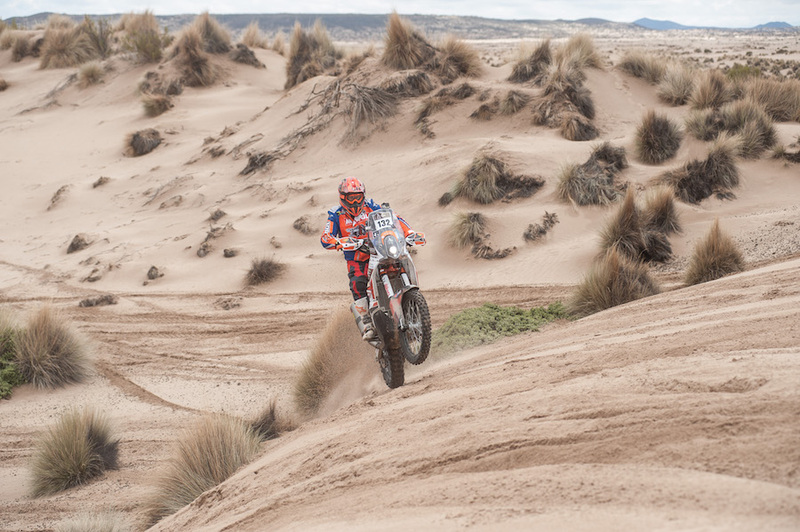 When I look at the Dakar, it was a selfish thing, it was my goal, my dream, but there’s a lot of guys who look at it when they have a big injury as being the end. We treat people in a wheelchair like they’re dead, but they’re not. People nowadays do so much cool stuff. You have the Paralympics and you have all these things where guys are doing Iron Man and handcycling and whatever, so I want to do another big ride at some point in the not too distant future to raise money to help these people get the equipment they need to do sports and continue living. What’s the moral to the Para to Dakar story? There’s so many things I’ve learned along the way, and one of the big messages I wanted to get across through the book and in my talk is when I had to ride through the night. In the Rally you don’t have to finish at a certain time, you don’t even have to finish when it gets dark, you just have to be on the startline for the next day. Some riders will stop riding when it gets dark, they give in. Life is like that. Sometimes when it gets tough and it’s hard, you have to ride through the night. And no matter how bad it seems at the time, how terrible it is, it’s just chapter one and it doesn’t end there. It ends where you decide it ends, and so you just keep pushing and sometimes a terrible chapter one makes for a really awesome story with a magnificent ending.